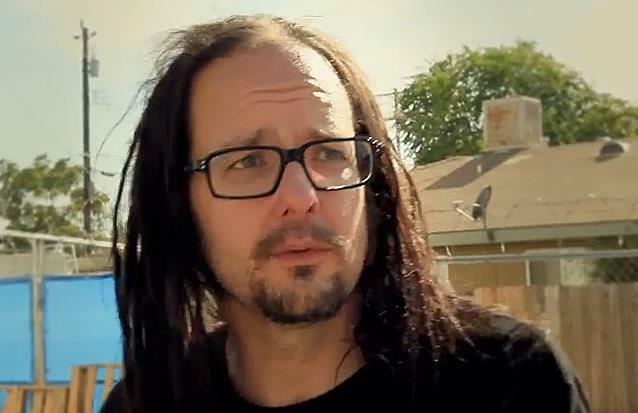 KORN singer Jonathan Davis has ruled out the possibility of a reunion with the band's former drummer, David Silveria, saying that the group's current incarnation is "perfect." Silveria was the second member of KORN's original lineup to depart, leaving in late 2006. Guitarist Brian "Head" Welch exited the group in 2005. But while Welch continued as a solo artist until rejoining KORN this year, Silveria retired to Huntington Beach, California and opened a restaurant. During an interview with U.K.'s Metal Hammer magazine, Davis was asked if there I any chance of Silveria coming back to the band. "No," he replied. "I don't wanna say any negative stuff, but where we're at right now is perfect and [current KORN drummer] Ray [Luzier] is an amazing drummer. He fits in good and doesn't have any typical drummer's complexes." Silveria surfaced recently to answer fan questions on his Facebook page, during which he gave the current version of the group a little bit of a slam while emphasizing how important he was to the group's original sound and even how they came together. Asked if he had heard the new KORN single, "Never Never", Silveria replied, "For all the fans asking the answer is no I have not heard a new KORN song. All I can say is I'm sure it's not funky and groovy like the original KORN. I don't even need to hear it to know that." Silveria added, "I am a funky groove drummer and Ray [Luzier, current KORN drummer) is a heavy metal drummer. That's why KORN will never sound as unique as we used to . . . KORN lost their groove." Silveria claimed he wasn't "talking crap" about his former group, but then went on to say, "Until they have the real 'funky drummer' it's just not gonna groove the way it could. I've made it clear that I would come back and restore the groove." Davis told The Pulse Of Radio a while back that he believed Silveria lost his passion for music. "David was there to write beats but he wasn't really there," he said. "He really didn't like playing drums. The first two albums, I think, he really enjoyed playing drums and then after that he just lost his love for playing drums. It happens. Okay, good for him, he wanted to move on and do something else." In other comments at his Facebook page, Silveria took credit for bringing Davis and Welch into the band, as well as getting them their management, saying, "None of them want to admit it was me . . . There are a lot of things I did for the band that they don't like to admit I did." KORN's 11th studio album, "The Paradigm Shift", will be released on October 8 and features the return of Welch to the lineup after more than eight years away. The new disc follows up 2011's "The Path Of Totality", which found KORN collaborating with dubstep artists on every track. Silveria in February pleaded guilty to a charge of allegedly driving under the influence. In exchange, prosecutors dropped the hit-and-run charge in connection with the March 2012 incident in which the 40-year-old musician — who played with KORN for 13 years — rear-ended another car on his way to breakfast in Huntington Beach, California. Silveria was sentenced to three years of informal probation, a three-month first offender program, and he was ordeded to attend a M.A.D.D. victim impact panel. Silveria last year joined forces with ANYONE members Riz Story and Miki Black in a brand new project called INFINIKA.